10 n Performance & Hotrod Business n December 2014 Nickels Strengthens KC Sales Warehouse distributor Nickels Performance has added Dan McLaughlin to the role of technical sales at its Kansas City location. McLaughlin will work with customers throughout the Midwest, accord- ing to the company, and has decades of experience in the performance aftermarket. "With Nickels' broad coverage and the large UPS one-day service area out of Kansas City, he is poised to make an impact in that area," the com- pany stated in a press release. "We are lucky to have him join our team." McLaughlin's past experience includes stints with Weld Wheels, Taylor Wire and other WDs, the company noted. Autoshop Solutions a Top Workplace Automotive website design and Internet marketing agency Autoshop Solutions, Apex, N.C., has received an employee-nominated award as one of the Top 50 Best Places to Work in the Raleigh metro area. To qualify for the award, the company first had to be nominated by an employee. After being nominated, winners were then ranked and chosen based on an employee-survey process conducted by Quantum Market Research, according to a press release. The surveys were anonymous and allowed employees to rank their company on categories such as fairness, credibility, respect and personal sense of camaraderie and pride. Winners of the award were selected based not only on the survey results, but also on the percentage of employee participation. "Autoshop Solutions has always focused on fostering the right kind of corporate culture," said Danny Sanchez, CEO. "Hiring people who share in our values of being both team-oriented and customer-focused is key. We work hard to provide our employees with a positive, fulfill- ing work environment, and our recognition as one of the Top 50 Best Places to Work validates that we are doing just that." Autoshop Solutions continues to be recognized with awards for its products and company growth, including producing websites awarded in AutoInc. 's Top 10 Websites for the past six years and being on the Inc. 5000 list of America's Fastest Growing Companies in 2014. Motor State Adds Snow Performance Warehouse distributor Motor State Distributing has announced the addition of the Snow Performance product line to its brand selection of performance power-adders. 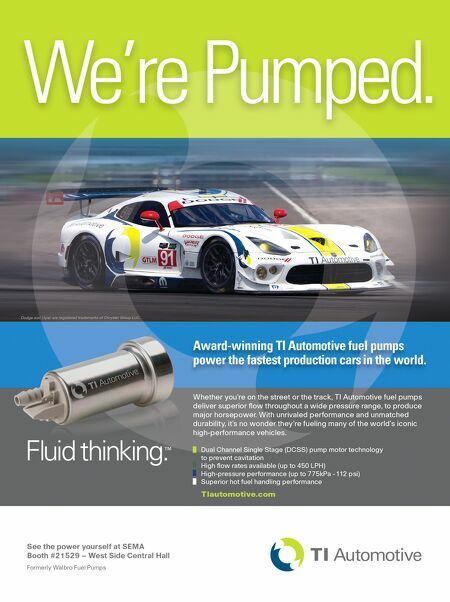 Snow Performance offers water/ethanol injection systems for gasoline and diesel applications. The systems use water and methanol to cool the intake charge, delivering improved power and drivability, according to a press release. Snow Performance products can be used on any naturally aspirated car- bureted engine, fuel injection, forced induction engine, turbocharged engine, positive displacement or centrifugal blowers. Motor State offers the entire Snow Performance product line. Livernois Re-releases Detroit Speed Apparel Livernois Motorsports, Dearborn Heights, Mich., has part- nered with Addy award-winning ad agency NWA Inc. to re-release the popu- lar Detroit Speed Shop and Detroit Muscle apparel and lifestyle line this fall. Hats, T-shirts, sweatshirts, work shirts and related apparel will be available, as well as handheld tuners and other performance parts, according to a press release. "There's so much genuine history here at Livernois—65 years of automotive experience as either an OE Tier 1 supplier, a performance parts manufac- turer or a winning racing team," said LJ Lobsinger. "The Detroit Speed Shop line's heritage remains unparalleled and it just seems natural for them to bring it back." Jobber and retailer packages with fixtures will be available. HP Tuners Acquires Race Render HP Tuners has purchased Race Render LLC, including Race Render, Track Addict, Bench Racer and Quick PIP products. 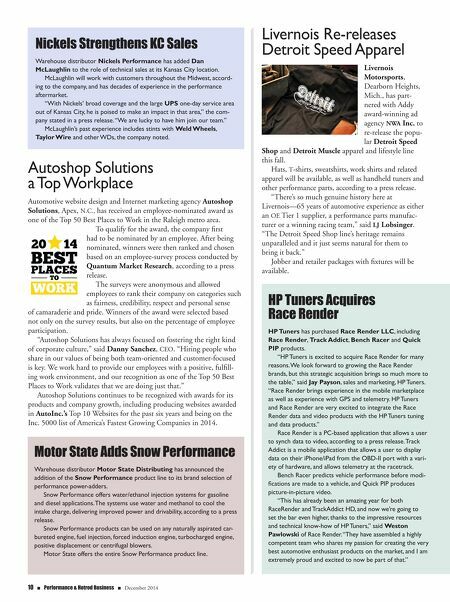 "HP Tuners is excited to acquire Race Render for many reasons. We look forward to growing the Race Render brands, but this strategic acquisition brings so much more to the table," said Jay Payson, sales and marketing, HP Tuners. "Race Render brings experience in the mobile marketplace as well as experience with GPS and telemetry. HP Tuners and Race Render are very excited to integrate the Race Render data and video products with the HP Tuners tuning and data products." Race Render is a PC-based application that allows a user to synch data to video, according to a press release. Track Addict is a mobile application that allows a user to display data on their iPhone/iPad from the OBD-II port with a vari- ety of hardware, and allows telemetry at the racetrack. Bench Racer predicts vehicle performance before modi- fications are made to a vehicle, and Quick PIP produces picture-in-picture video. "This has already been an amazing year for both RaceRender and TrackAddict HD, and now we're going to set the bar even higher, thanks to the impressive resources and technical know-how of HP Tuners," said Weston Pawlowski of Race Render. "They have assembled a highly competent team who shares my passion for creating the very best automotive enthusiast products on the market, and I am extremely proud and excited to now be part of that."